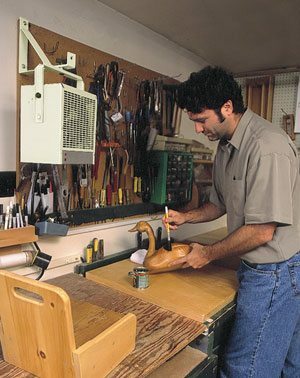 By using a garage heater your space can be repurposed as a workshop or as an expansion of living space. In some mild climates very little needs to be done to make use of the space year round. In less temperate environments such use demands serious consideration of the best way to bring heat into the garage. A propane heater, natural gas heater, or garage electric heater offers the most common method used for this function. Forms of garage heater commonly used for small jobs include the small garage electric heater in the form of space heaters. The simplest and most accessible form of space heater is the small model commonly available through warehouse and hardware stores. These heaters can best be used in mild winter climates. Drawing on common home electrical outlets a small garage electric heater will heat a modest area, warming the primary living and work areas without altering the temperature of the margins of the garage very much. In much of the southeast and southwest this form of space heating is quite adequate, and comparatively inexpensive. A gas heater is the next most common method of heating a garage, used in situations where a more substantial heat source is desired. A gas heater can use both propane and natural gas. Which is chosen depends on what fuel sources are already present and easily accessed. In a home already set up for natural gas it is seldom a problem to get a licensed workman to expand on an existing line. If you live outside an area with a good natural gas distribution system, however, a garage propane heater that depends on gas that can be delivered by the tank or bottle may be more practical. For a big heating job you can also consider a large garage electric heater. If your house is already set up with some form of electrical heating it may be most practical to base your garage heating strategy on an expansion of your existing system that incorporates a big garage heater. While many consider electrical heating to be a high cost method, it can prove cost effective when using the best of modern technology and drawing on existing systems. Certainly a electric garage heater is a better choice for many than a major overhaul to provide natural gas. Other heating methods exist, from the expensive but ingenious heat pump to the classic old fashioned wood stove. Each offers an array of advantages, from the passive technology of heat pumps to forms of water based heating in which pipes carrying hot water are channeled through and around the walls and floor of a garage. Some people have chosen to use forms of solar panel. Before making a final decision about what garage heater to use you should take the time to review your existing system, the resources available in your vicinity, and the amount of heating power you actually need. For most people, however, the choice of a garage propane heater or a garage electrical heater will cover the best and most easily installed and used heating technology to make otherwise wasted garage space part of the living system of a home.